Valentine’s Day spells hot romance for couples around the globe. 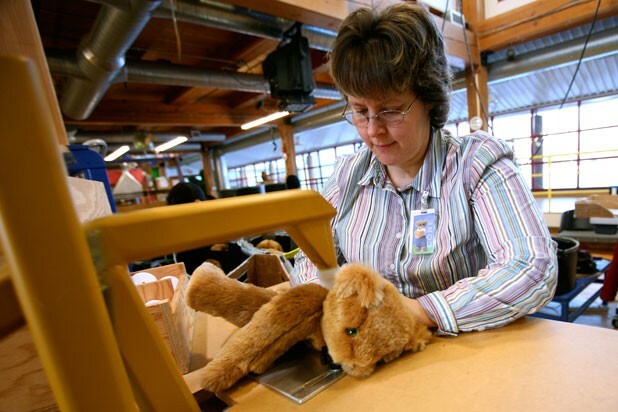 But at the Vermont Teddy Bear Company headquarters in Shelburne, it spells work: The company hires 1200 seasonal workers to help 220 core staffers handle a yearly influx of “V-Day” bear orders. VTB founder John Sortino first peddled the cuddly ursines on Church Street in 1981. Riding a wave of explosive growth in the early 1990s, the company moved into a colorful 60,000-square-foot facility off Route 7 in 1995. Today, VTB exports more than 350,000 bears each year and welcomes more than 150,000 visitors to its quirky Shelburne digs. On a recent weekday morning, the shop offers a sobering reminder of the era of TR’s cousin, FDR: Vermont Teddy’s newest item, the “Recession-Proof Love Bear,” perches beside the cash register as a nod to the economic crisis. (More sobering, the company laid off 35 workers at the beginning of January.) The bear wears red suspenders and a wooden barrel reading, “YOU’RE MY BEST ASSET.” At $99.95, it’s one of the priciest bears in the VTB catalogue. After seating herself at “Stuffer #3,” a pink contraption resembling a jumbo dryer, Fay dons a pair of black ear protectors. Then the soft-spoken woman, who wears a striped shirt and brown pants, grabs a tube that injects bear parts with synthetic guts. The scene feels at once fairy-tale fanciful and old-school industrial — think Willy Wonka meets Rosie the Riveter. Back in the assembly area, Fay discovers a fresh box of inside-out bear appendages at her turning station. As she starts turning the next batch, she agrees to answer a reporter’s questions about her job of the past 13 years. PAM FAY: I used to do this at home, and they eventually brought me in-house. SD: How did you fall into this specific task, as opposed to sewing? PF: I’m not very good on the sewing machine. [Laughs.] When I was at home, this is what I did, so I knew how to do it. SD: Why are all the bears the same shape? PF: I think it’s just the way the bear looks. You’ve got your legs and your arms, and it comes together. SD: Once the bear is done, how does it get accessorized? PF: It goes to [the fulfillment center]. They’ll get the outfit you want. Then they’ll get the naked bear and they dress it on the line. SD: What about the bear that’s sold in his “birthday suit”? PF: He gets a bowtie. They never go out of here naked. They always have a bowtie at least. SD: How did you learn to do this job? PF: It’s not a hard job, you know? You just have to make sure you know your rights and your lefts, or you can put the bear together wrong. SD: Have you worked on other assembly lines? PF: I worked at [Harrington’s of Vermont] in Richmond on their packing line. We packed and stuffed meat. SD: How does packing meat compare to stuffing bears? PF: It’s not so cold. That place was cold. SD: This place is pretty sunny. PF: Yeah, you go fast, and you’ll warm right up. And we have so many orders to get out, especially with the DYOBs. PF: Design Your Own Bear: It’s a new thing they just started. You can get special stuff written on the paw pads; you can order over the Internet what color eyes and what color bear you want, and if you want writing on it. Like this one [holds up a bear leg] is probably going to be “Will you marry me?” when I get done. It’s a special bear, you know? SD: Do special bears make your life difficult? PF: Not really. It’s a little bit harder because I have to make sure that when I sort, the right name goes to the right bear. But it’s not bad. SD: You also do bear repair — bear doctoring. PF: Yes, the bear hospital. SD: And these bears get universal health care, right? PF: Yes. They get it all free. They come in, they get fixed, they get a little hospital bracelet when they leave. SD: Have you ever gotten a bear that was too mangled to be mended? PF: Oh, yeah. Then they get a new one for free. PF: A lot of them are dog attacks. Dogs just love these bears. Or the lawnmowers, and lots of bears get caught in fires. We’re really good about replacing your bear if something happens to it. SD: Have you ever received an “I HEART DOGS” bear that had been mangled by a dog? PF: [Laughs.] No. But dogs do like these. My dogs even like them. SD: Have your dogs ever eaten your bears? PF: They’ve gotten to one of my bears. It wasn’t supposed to be for the dogs, but they got it. SD: What sorts of bears do you own? PF: I had my 10th anniversary three years ago, and they gave me a motorcycle bear. When you’ve been here 10 years, they design a special bear for you. My husband and I have a motorcycle. PF: I don’t have too many bears; I see them all day. But I used to give them for presents, because everybody loves a bear. SD: Why do people like teddy bears? PF: I think they’re just so cute, you know? Everybody likes a stuffed animal . . . And now that we have the DYOB bears, they’re even more popular, because you can send that little special message.